I know plenty of people who take their engagement rings and/or wedding rings off whenever they do dishes, put on moisturizer or whatever. I’ve even been told that it’s better to do so because it keeps your jewelry in better shape and helps avoid scratches, dulling and other issues. I’ve never been one of those people, though. From the time that Dean got down on one knee and asked me to marry him until now, I’ve only taken the ring off a handful of times. 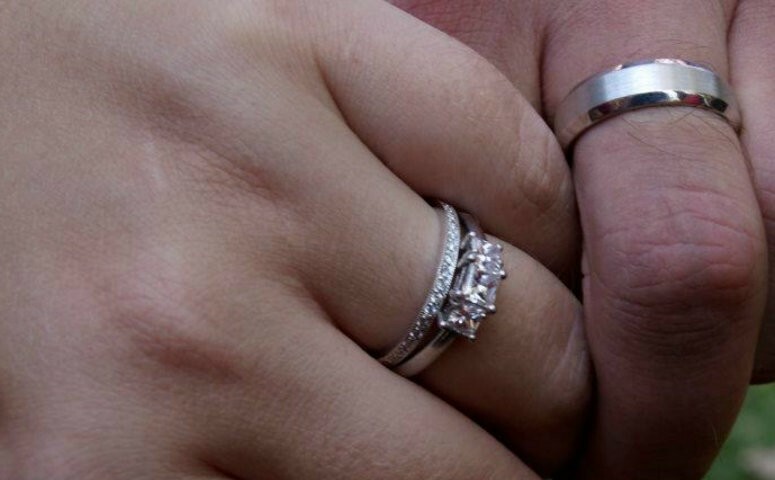 Since we exchanged vows and said “I do”, I can remember a single time I took my rings off (for cleaning). The rings and what they mean feel like part of me, so why would I ever want to take them off? Well, now I might not have much of a choice. I am currently experiencing the joys of pregnancy edema. Like everything else awful that can happen during pregnancy, it’s totally normal. Basically, it just means that my feet swell up by the end of the day and I have to keep them elevated and drink plenty of water to try to keep the water retention at a minimum. However, the stiffness I was experiencing in my hands seems to be getting slowly worse, with my hands are starting to swell. Again, all totally normal and harmless, but it’s gotten to a bit of a sorry state. My fingers are now so swollen that I actually can’t get my rings off, which means that I had probably better do so, soon. This means that I’ll be doing all the awesome tricks to be found on Imgur. Beyond the soap and cold water technique, I think I will have to resort to that cool video of the string that gets tightly wrapped around the woman’s finger and then unwrapped so that the ring slides off easily and relatively painlessly. It’s far better than having the rings cut off my fingers, but it still makes me so sad. It feels like a piece of me will be removed. And yes, I know that I can put them back on once Harley is born and my body starts to return to normal. It just makes me sad that I won’t be able to wear my rings. I suppose I can wear them on a chain around my neck or something, but it’s different and weird for me. I could just leave the rings on for now, but I’m just worried that my fingers will swell even more and start cutting me and that they will HAVE to remove them. Better to take them off now while I still (hopefully) can… Now is when my awful joke idea of having my name and Dean’s tattooed under our wedding bands doesn’t seem so bad. Still, at least I know in my heart that I’m married, and I suppose that’s all that matters. But I will miss wearing something shiny that makes me smile every time I look at it. Suppose I’ll have to wear them on a chain, just so that I can still sort of feel that.